Architecture Metals is committed to enhancing the architect's artistic vision with products that provide functional and structural reliability. During the design phase, our engineers work closely with designers to insure that performance needs are harmonized with architectural requirements. 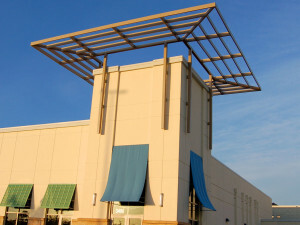 We will propose a full list of design alternatives for louvers, sunshades or flood mitigation projects. The latest CAD systems are integrated with leading edge computer modeling programs to enable design staff to ensure that interface and performance parameters are met prior to entering hard tooling. We offer a wide array of product literature, specifications and drawing aids.